A motorcycle slammed into the back of Sayd Omar Morales Akmad’s car as he was driving. When he looked at the damage, Sayd, a father of two boys, was far from happy. In the video you’re about to watch you’ll see a man with his girlfriend arguing outside in a parking lot. The argument is already heated when the video begins as the woman continuously slaps, kicks and punches the guy while screaming, “What the f*** did you do”. Giving him a bit of credit here he stands there and takes it for a while… but then things get ugly. He beat the sh** out of her, and it doesn’t appear justifiable in the slightest. At that point she’d backed away and was attempting to leave, that should have been the end of it, but it doesn’t appear like he understood that. 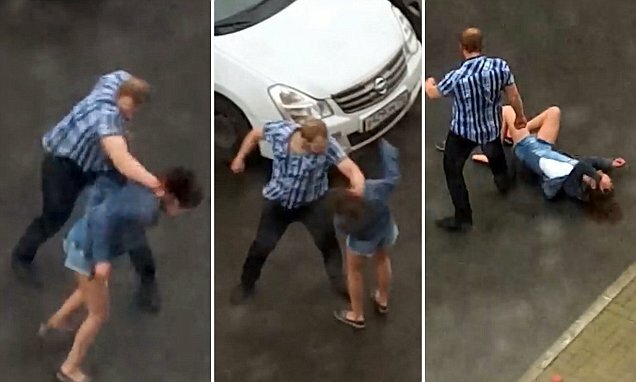 When a passing woman came to help he ends up assaulting her as well, fearing she held evidence against him on her phone. What a scumbag.